Newton's Nook Designs: Some Puppy Love Today with the Canine Christmas Stamp Set! 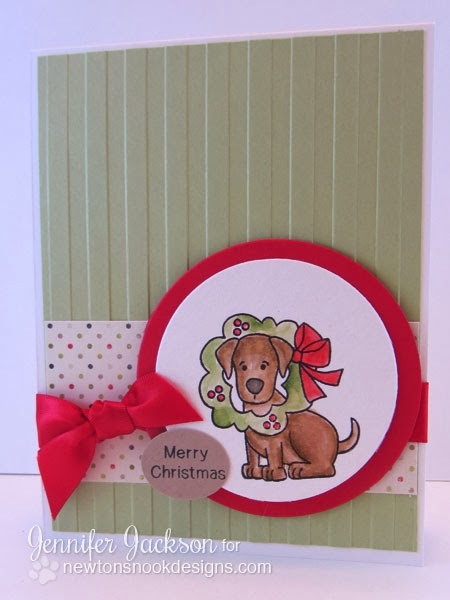 Some Puppy Love Today with the Canine Christmas Stamp Set! 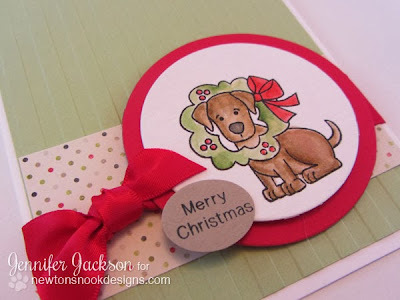 I'm am just loving this cutie patootie puppy from the Canine Christmas Stamp set! He is so much fun to color with that fun wreath around his neck! To create this card I stamped him with waterproof ink on watercolor paper and colored him using Tim Holtz Distress Markers and a waterbrush. This is such a fun technique! Then I cut him out with a circle die and made a slightly larger red circle to frame him. The rest of the card is really simple... I small bit of polka dotted paper, some green paper embossed with a striped embossing folder in the big shot- and some thick red satin ribbon! Oh, and I added on that "Merry Christmas" sentiment too! Shop our sale - all weekend long! Our Awesome 20% off sale is still on! 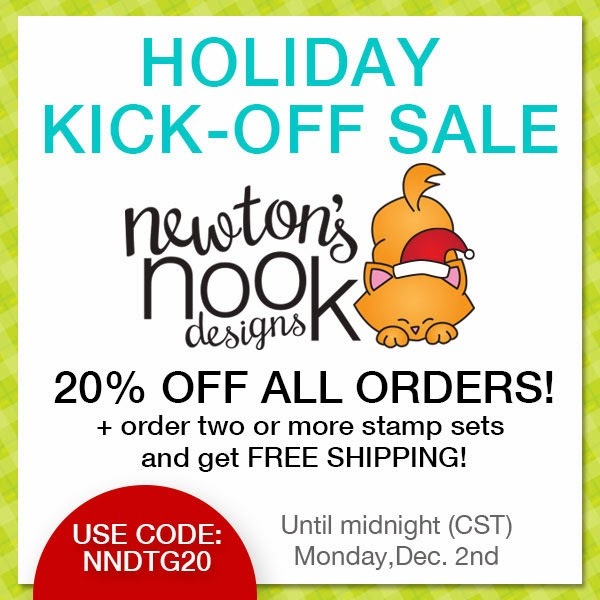 Head over to newtonsnookdesigns.com to grab your favorites and pick up some gifts too! 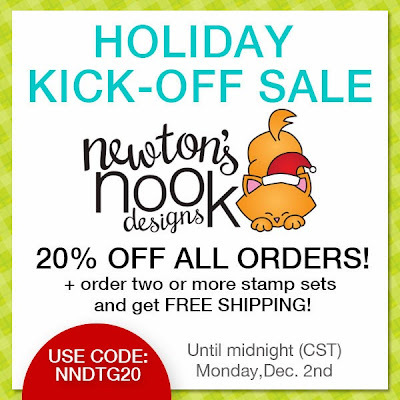 Use code NNDTG20 in your shopping cart! Come back on Monday for our "Deck the Halls with Inky Paws" week! Special Guests All NEXT WEEK!! Don't forget - Next week we're having a special guest each day - Monday through Thursday and then a BIG AWESOME INSPIRING Holiday Blog hop on Friday, Dec. 6th! I can't WAIT!!!!! Your canine cutie is adorable! Your images are perfect for colouring - and aren't the Distress Markers wonderful! I may have to make a set of little cards with my new snow critters...See, you've inspired me already...Have a great Saturday; excited about the delights you'll dazzle us with next week! Such a sweet card and I just love that little pup! Very cute image...great colouring technique. Era, to start, includes a good effect on “puppy love".I remember those times when my mom prohibit me to see a specific child called Bryan. He was a large player that loved strolling although park with your fingers presented small ingesting only 1 cotton chocolate stay together. I think that I was 12 which caused it to be therefore innocent. Generally small old enjoy is the main one you fanaticize and time dream of the most.